If you want to add an inch or more to your arms you need to do more than just biceps curls and triceps pushdowns. 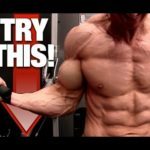 In fact, more than just the arm exercises themselves you need to incorporate advanced arm training techniques that will force more growth than ever before. In this video, I’m going to show you 4 ways to add 1 inch to your biceps and triceps. The common theme among all of them is that you are going to have to work hard. The first is focusing on the eccentric portion of an exercise. I’m not just talking about slowing down the negative portion of a repetition. That is something that should be done every time you train. What I’m referring to is a planned eccentric only aspect of your biceps and triceps workouts that allow you to train beyond failure with additional forced reps. I demonstrate how to apply this to a cable squat curl. After reaching concentric muscle failure you squat down with the bar on your thighs and rest your elbows on your legs. From here, allow the ascent from the squat to take your arms for a ride back up to the top. Your elbows should resume yet another rep from the 90 degree position and help you to take the intensity to a whole new level. Mechanical drop sets are another way to push harder than with a traditional set. When you string three biceps exercises together that allow you to keep the reps coming even when fatigue in one has made it feel as if no more are possible, then you have successfully come up with an effective mechanical drop set. Here I demonstrate the standing simultaneous dumbbell curl into the alternating curl into a drag curl. By lessening the demand on the core in the first two exercises and then shortening the moment arm in between the last two, you can keep pushing and gaining. The same thing can be done with the triceps as well. Take a pair of dumbbells and lay down on a bench. Perform a dumbbell triceps extension to failure and immediately let the arms shift forward a bit so you can do the modified french press. Before calling it quits however, you can keep it going by dropping your elbows to your sides and doing close grip bench presses. If you are ready for a real burn you can try the metabolic occlusion method shown for your biceps and triceps. By disrupting the normal blood flow through the limb by “kinking” the hose via a bend of the elbow you will see how to use light weights to build muscle in your arms. Both of these are intense and may not be something you are used to. Build up to them and do them for longer and longer each time. Finally, the overcoming isometric technique is one of the most powerful that you can use and is likely something you have not utilized enough of. Make sure to include enough reps in the different portions of the range of motion to equally build your strength throughout and increase your motor unit recruitment capabilities. Bottom line, is if you want to build bigger triceps and biceps then you have to take advantage of the higher intensity training techniques that the arms provide you. Incorporating even just a few of them will likely help you to add up to an inch or more to your arms in a short period of time. When you are looking for a complete program to take your total body gains to a whole new level, head to http://athleanx.com and get the ATHLEAN-X Training System.